This very practical Red Dot Finder (R.D.F.) comes with a handy, quick -release bracket included in the price. 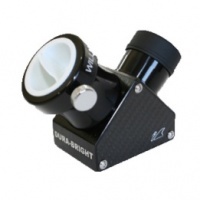 It fits perfectly on ZenithStar telescopes. Centering your objects in the sky has never been easier! Look through the finder with one eye leaving the other open, and you will see one of the four selected LED shapes in the sky. Quick Release. Quick-release bracket/base included in the price. The new base can be mounted with M5 and M6 screws and has a longer bracket for easier positioning. Especially suited to ZS66 and ZS80.